NOSA: If you follow them on Instagram, you probably know this already but #EatDrinkFestival regulars, Roadster Burger, have got a new/proper physical location. It's right across the street from Domino's in Lekki. FOLLY: It's a burger bar and lounge hybrid. We haven't been yet but we plan to over this long weekend and maybe you should too. 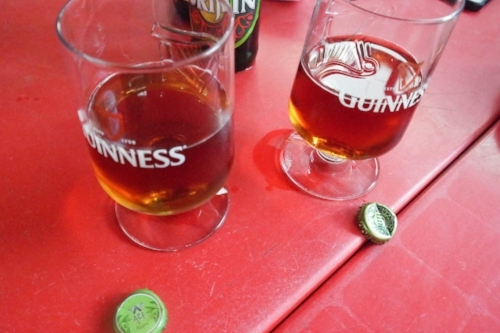 FOLLY: In this week's EDL Taste Test, we compared Ace Roots and Orijin. Wherever you find yourself after work today, order one Orijin and one Ace Roots, and you and your friends can also try to tell the difference. EMEKA: Bring a bottle & blanket. You can also rent blankets at the venue. Hopefully, it's a sunny Sunday and we can enjoy some good outdoor vibes. The location is 19b Adeyemi Lawson, Ikoyi, Lagos . RSVP here: http://goo.gl/forms/jy9qmxi7Fx or on the NTDIL app . RSVP Closes Sept 10 and entrance is N1,000 without RSVP. NOSA: So a friend is organizing this and I think it should be pretty fun if cars are your thing. There'll be a couple of vendors from our festival out there too. It's this Saturday at Eko Atlantic from 12-7 pm. There'll be a car exhibition, a small race circuit, and you get to test drive some BMWs.